As the name tells it’s a simple text-to-speech system which enables your viewers to let a voice say what they wrote in chat. 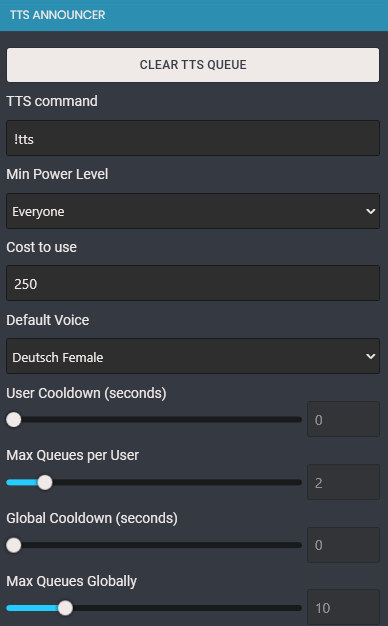 It allows a lot of configuration like the “Min Power Level” which says who can use it (Everyone, Regulars, Subs or only Mods), the cost of it, cooldowns and supports a lot of languages. 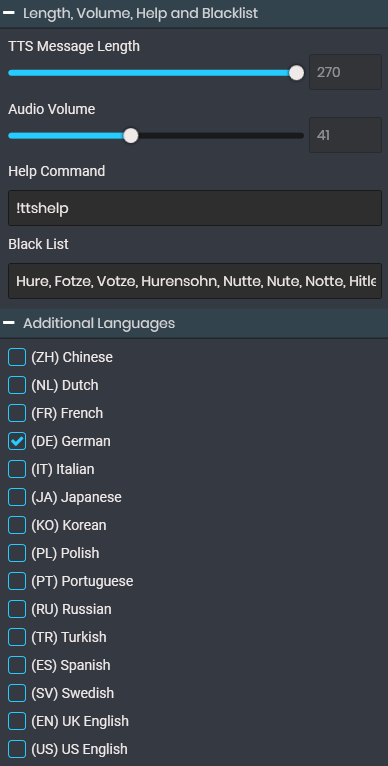 Note: Since that also can lead to some trolling we also included a “Black List” so you can filter out words you definitely don’t want to hear in your stream. And the overlay is currently not part of the script, but you can use it additionally. We also work together with jaku – the creator of the API – so we can include settings for the overlay customization but for now we don’t support that. I’d suggest you putting the BrowserSource behind the game or set the size to 1×1 so it’s not visible. Fixed a bug where an error occurs without saving first. Fixed a bug which happens when you leave the blacklist empty.